The iRobot Roomba 980 Robot Vacuum . The Roomba 980 has the latest iRobot technology including: Tangle-Free AeroForce Extractors, which gets rid of brushes, increasing suction and airflow no matter what surface it is vacuuming. It is effective at getting dirt, dust, pet fur, and pet hair from a variety of surfaces using its patented 3 stage cleaning system. The iRobot 980 has a HEPA filter which traps dust and allergens and will keep your air clean and smelling fresh, great for those with allergies, pets and pet hair. New to this model is built-in WiFi, so you can use the iRobot HOME App to control and schedule the Roomba 980 for cleaning. This sophisticated robot vacuum has Dirt Detect™ Series 2 Technology uses both optical and acoustic sensors to identify dirtier areas and spends more time cleaning them. Using advanced software and sensors, the Roomba 980’s iAdapt technology ensures that it vacuums every section of your floor, including areas you cannot easily reach, such as under furniture. 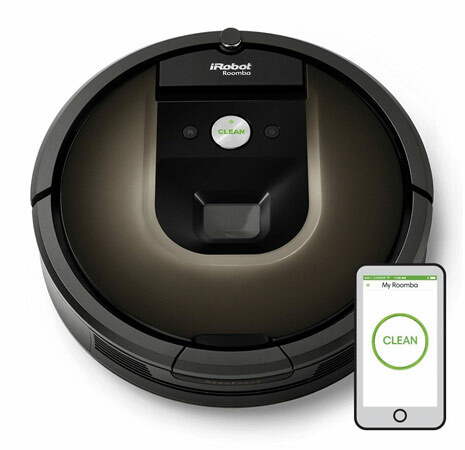 iRobot 980 Vacuum Features: As a multi-floor vacuum, this robotic vacuum will automatically adjust to clean carpets, hardwood, tile, and linoleum floors as it moves through your home. Roomba will vacuum every section of your floor multiple times, and its advanced software allows it to get around obstacles, move along walls and to avoid falling down stairs, drop-offs, and avoid tangles from loose cords. New to this model is Carpet Boost which increases airflow up to 10x on rugs and carpets. AeroForce Extractors: replaces the brushes on previous Roomba models, and breaks down dirt and debris and lifts the dirt into the new Airflow Accelerator for much better pickup. Full Bin Indicator tells you when to empty the dust bin. The Roomba 980 starts working for you at the push of the CLEAN button (on the top of the vacuum). The included Virtual Wall Barriers restrict the iRobot 980 from leaving a specific room in your home (2 units included). 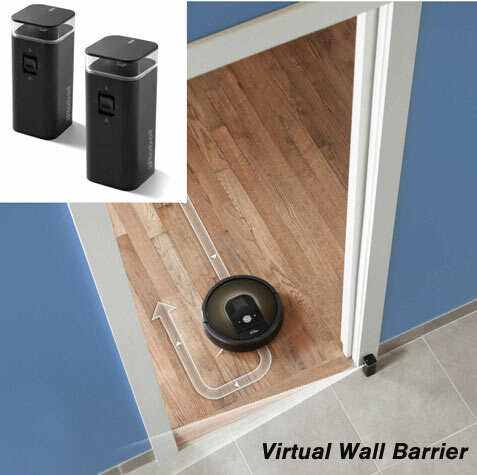 Virtual Wall Barriers: The included Dual Mode Virtual Wall® unit acts like a barrier and will confine the robot to specific rooms and areas, so you only clean the room or rooms that you want done. A new Halo mode can keep the robot away from objects, such as a pet bowl. The newest Roomba 980 model comes complete with Two Virtual Wall Barriers. The Roomba 980 will automatically return to its Home Base® to dock and recharge between cycles. iRobot provides Voice-activated control thru Alexa and Google Assistant. What’s in the Box: iRobot Roomba 980 Vacuum, 1 iRobot Lithium Ion Battery, 2 Virtual Wall Lighthouses, Integrated Home Base, Remote Control, and 1 Extra HEPA Filter. On-Board Scheduling: The Roomba 980 can be scheduled to perform up to seven cleaning sessions per week, even when you’re not home. Smart-Review Commentary: The iRobot Roomba 980 Robotic vacuum has made huge advances over previous Roomba robotic vacuums. This is one of only two models that has built-in WiFi. The new iRobot HOME APP allows you to control and schedule cleaning from Roomba 980 from your Smartphone or Tablet. New is the “Recharge and Resume” feature, where the vacuum recharges and then resumes cleaning once charged. This is the only Robot vacuum with Carpet Boost, which provides up to 10x the air power on carpet and rugs. The new Tangle-Free AeroForce Extractors provides a 10X improvement in air power than previous Roomba generations. It no longer uses brushes, and has better contact with the floor or rugs. Its HEPA filter will filter out dust, dirt, and allergens. The 980 model comes with two Virtual Wall Barriers for great control over where the roomba travels. iRobot vacuums are extremely sophisticated cleaning machines, using the latest software and sensor technology to vacuum your entire floor, yet avoid obstacles. Soft bumpers cushions the vacuum when it encounters furniture and walls. This model has Multi-Room Navigation. It will clean areas that vacuums rarely go, such as under furniture, under a bed, in corners. The Roomba 980 is better equipped than previous models to handle fibers like hair, pet hair, pet fur, lint and carpet fuzz. It is ideal for those with pets. The larger dust bin requires less emptying than previous models. This vacuum can do a comparable job to many uprights, because this vacuum goes over a dirty area many times, until clean, using Dirt Detect 2 technology. Some reviewers have even reported that this vacuums does a better job than their manual upright. If this fits your lifestyle, it is an excellent robot vacuum to clean your rooms while you do other activities. Very simple operation, just press the clean button. You also have the option to schedule cleaning when you are not home with 7 day scheduling. 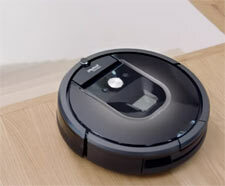 The lithium ion battery powered 980 model has the longest runtime of any robot vacuum we cover (2 hours). This top of the line model has received extremely high marks from professional reviews as well as outstanding reviews by consumers. This model is not only a Top pick, but won our Smart-Review BEST of 2019 award for robotic vacuums in 2019.